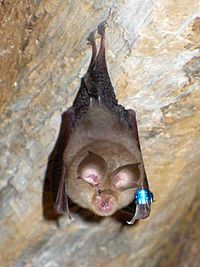 Ar frigribell vihan (Rhinolophus hipposideros) a zo un askell-groc'hen eus Eurazia hag Afrika. 4 cm eo hirder he c'horf hag etre 5 ha 10 g he fouez. An hini vihanañ eo e-touez ar frigribelled. Bevañ a ra a-stroll e tachennoù koadek ha strouezhek. Kemmoù diwezhañ degaset d'ar bajenn-mañ d'an 21 Gou 2015, da 09:38.